Three letters O I L were always the key to the otherwise inexplicable invasion of Iraq. 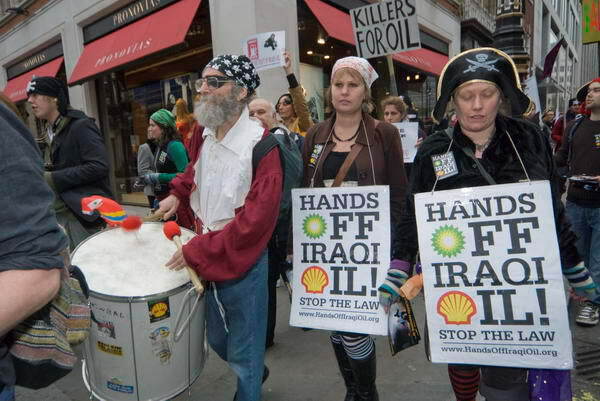 Oil, state owned, was Saddam’s greatest – almost his only – asset. The giant multinationals wanted rid of him so they could make a killing – and now they are getting their way through the Iraqi government. The first invasion was military, the second is economic. The first has been a disaster for the Iraqi people, and the second will ensure that disaster continues long-term. The tour last Saturday was a fun event – about a very serious problem. People enjoyed dressing up and it certainly helped to gain some attention from the West End crowds. This entry was posted on Monday, February 25th, 2008 at 11:42 pm and is filed under My Own Work, Political Issues. You can follow any responses to this entry through the RSS 2.0 feed. You can leave a response, or trackback from your own site.